You’re probably familiar with ylang-ylang oil, a commonly used oil in complementary medicine, even if you’re not sure of the name. With a light floral scent that mixes well with others, it generally used as a base in most scented perfumes and many cleaning products. There are multiple proven benefits and uses to ylang-ylang essential oil, and its pleasing scent is one way to receive those benefits. Use a few drops in your diffuser at work, especially when you’re feeling the stress of a project or deadline. You might even put some together with lavender and a carrier oil to create a de-stressing roll on that you can scent throughout the day. Relaxing will help improve your focus and ability to get the job done right. This oil could be part of a complementary treatment for times when you are feeling down or stressed. Using a 1:1 mixture of ylang-ylang and a carrier oil would make for a very relaxing massage, and you would receive the relaxing benefits from skin absorption and inhalation of its light floral scent. Ylang ylang is an anti-oxidant and helps cells by preventing oxidative stress from free radicals. A few drops of oil in a carrier oil can be applied to the skin of the face to help prevent the signs of aging. Adding a few drops of ylang-ylang and jasmine to a carrier oil such as almond would create a massage oil that contains the most powerful scents when it comes to increasing arousal and encouraging physical intimacy. A massage with this oil would be an excellent way to bond with someone you share a physical relationship with. Using this oil as a spray in areas of your garden where mosquitoes are most likely to propagate will help prevent these pests from taking over your backyard and help safeguard your family from a variety of diseases. Add ylang-ylang to other oils such as tea tree or sweet orange as well as a mix of vinegar and distilled water to create a disinfectant for your home and leave a scent that lifts the mood and reduces anxiety at the same time. I have suffered from varying degrees of depression since having children, though it has likely been much longer than that. I’ve been on different types of medication to help alleviate the symptoms, but nothing ever treated everything. Sometimes my mood would improve but I’d be left with anxiety, or there were days when it seemed like I wasn’t on medication at all. And, to top it all off, I suffered from low libido due to the treatments. My relationship was suffering even as I tried to treat a serious medical condition. Ylang ylang has become one of the base oils for my custom mixes. When it is time for bed, some chamomile, lavender, and ylang-ylang are staples in the diffuser. I also make a massage oil with almond oil and ylang-ylang for when my spouse and I would like to be intimate. The scent relaxes me and helps alleviate any performance anxiety either of us may be experiencing. The stress and worries of the day seem to disappear after a good massage. I also like to use it as part of a mix at work, usually with lemon or orange, sometimes rosemary, to stimulate my mind and help me focus but to keep me from becoming stressed by deadlines or frustrated when something doesn’t turn out as intended. I find that my anxiety takes a back seat and I can move on from mistakes more easily, allowing me to let go and keep working productively. When using essential oils, using the best grade is the easiest way to prevent any issues you could have. This is especially important if you intend to ingest it. A concentrated oil will only require a few drops to release its calming scent and should last a while when added to your diffuser. Using this grade of oil will also prevent any skin irritation if you are using it in oil for a massage. A good grade of oil blends well with other oils and shouldn’t overpower the other scents. Many people have trouble finding deodorants which are completely natural and have a scent that lasts. The ingredients of this deodorant are plant-based with no added chemicals. 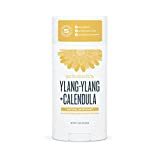 The sweet scent of ylang-ylang is paired with calendula, giving it a powerful antibacterial property, killing the bacteria in sweat that causes odor. Having the smell of ylang-ylang means that you can carry this calming aroma with you wherever you go. Always be sure to use therapeutic grade oil when ingesting ylang-ylang or intending to apply topically to prevent any reactions. Use caution when using this oil if you are taking medications for hypertension as it may cause an unsafe drop in blood pressure. Diabetes should use with caution since ylang ylang may lower blood sugar and cause hypoglycemia. Always mix 1:1 with distilled water or carrier oil such as almond to prevent skin irritation. It is easy to see why ylang-ylang is popular in many beauty products and would be a beneficial addition to your essential oil collection. Be sure to share this information with anyone who might be looking for a light floral scent for their home or some help with intimacy. Ylang ylang may be what they are looking for.